The friend zone is like the penalty box of dating, only you can never get out. Once a girl decides you're her 'friend', it's game over. You've become a complete non-sexual entity in her eyes, like her brother, or a lamp so says Ryan Reynolds in Just Friends. Yet, some men and women seemed doomed to live their life in The Friend Zone. Why do we put perfectly nice potential suitors in the friend zone? How do some people get out and go on to create happy long-term relationships? What can be done to get out of The Friend Zone and into the Love Zone? 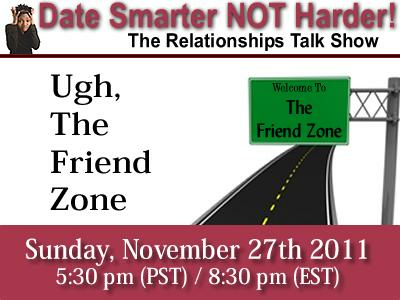 Join us for a fun and enlightening discussion on modern dating on Sunday, November 27, 2011 at 5:30 p.m. PST/8:30 p.m. EST. Call in to 347-327-9215 to participate in the live discussion.